What is Easter and What Does it Mean? What Are People Celebrating at Easter? If you are unfamiliar with Christianity, you may be wondering what everyone is celebrating at Easter and why there are egg hunts at Easter. That's a good question, and I'm guessing that many Christians don't even know why there are egg hunts at Easter! Over 2,000 years ago a baby was born in Bethlehem to a young virgin by the name of Mary. (Yes, you read that correctly, a virgin.) The baby's name was Jesus. This holiday is what Christians celebrate as Christmas. "But wait!" you say, "I asked about Easter." Yes, we will answer your questions about Easter, but you see, there can't be an Easter without Christmas. To be certain Jesus had died, the soldiers pierced his side with a spear, and water and blood flowed from his body. This is the day Christians acknowledge as Good Friday. You can read about it here. But this is where the story of Jesus becomes very interesting. As evening approached, two of his friends removed his body and buried it in a tomb (a cave), with a heavy rock sealing the entrance. 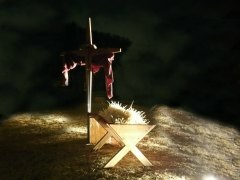 The Roman governor had ordered this because he heard that Jesus claimed he would be raised from the dead in three days. He wanted to be certain Jesus' friends did not remove his body from the grave and claimed Jesus rose from the dead. Are you ready for what happened next? Can you guess? The Romans guarded the tomb--until a violent earthquake happened on the morning of the third day. An angel of the Lord appeared to the guards, who were so shocked they appeared as dead themselves! (Wouldn't you be?) Two women, friends of Jesus, had come to the tomb, but the angel said to them, "Do not be afraid, for I know that you are looking for Jesus, who was crucified. He is not here; he has risen, just as he said. Come and see the place where he lay. Then go quickly and tell his disciples: 'He has risen from the dead and is going ahead of you into Galilee. There you will see him.' Now I have told you." So the women ran to tell the rest of Jesus' friends and while they were all together, who should join them but Jesus himself! And this is Easter Sunday. At this point, you may be thinking this is a fantastic story, and you'd be right. But it is also a historical fact, because Jesus appeared to many people over a period of about forty days. You can read about these events through the eyes of four different people who witnessed them here. You can also read about Easter as written by contemporary author, Charles R. Swindoll, here. If you prefer to watch a rather accurate movie made of this account, check out Mel Gibson's The Passion of the Christ. Do you want to talk to someone about what you just read? There are people standing by for a live chat. Just click here. Or you can call and talk to someone in Frisco TX, 469.252.5200 or 972.473.5097. Don't worry; they'll just answer your questions. You don't need to meet with anyone or even give your name. What do Easter Eggs have to do with Easter? Are Easter eggs in the Bible? Nope! But apparently an early church stained some eggs red to symbolize the blood of Christ at his death on the cross. It is said that the Easter egg has become a symbol of life for the Christian church, but I can tell you that even the most devout Christians today probably wouldn't be aware of that symbolism. Where did the Easter Bunny come into the Picture? The legend of the Easter Bunny actually has roots in Germany, where Lutherans (a Christian denomination) created the story of the Easter Hare looking for good little children on which to bestow colored eggs. He is sort of the Santa Claus of Easter. Do I have to be a Christian to attend an egg hunt, especially at a church? Nope. The civic leaders and churches are putting these egg hunts on for the community. 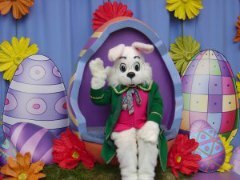 If I attend an egg hunt at a church, will folks try to get me into their church--like a cult? No, that's not at all how Christianity "works". You see, at the heart of Christianity is this: God loved you so very much that He gave His very best for you, His son, Jesus Christ. Jesus is a gift. And the Easter egg hunts are the churches' gifts to you and the rest of the community. Go have fun.